3hr indoor cycling event at participating clubs across N.E. 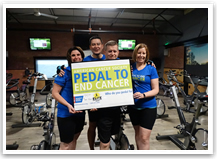 The 2019 Pedal to End Cancer season is here! 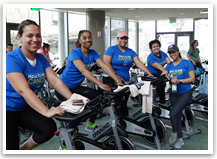 Join us as we pedal together to honor cancer survivors, raise awareness about reducing cancer risk, and raise money to help the American Cancer Society fight the disease. One team on the website reserves ONE BIKE for the entire 3-hour event. To sign up as an individual and spin for the full event, you can create your OWN team. Creating your team will reserve your bike for the entire 3-hour event. You can make your team name your full name and then proceed with registration. To sign up to take turns sharing one bike during the event, you can create a team to reserve one bike for the entire event. Invite everyone that will be sharing the bike with you to join your team! Teams are responsible for assigning their own time slots for the team's bike! Please email nepedaltoendcancer@cancer.org if you have questions. *Alternate dates are available throughout the year. 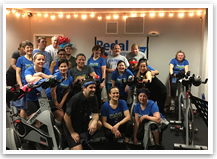 If you would like to get your gym involved, please email NEPedaltoEndCancer@cancer.org. Download our print materials that help you and your team promote and raise funds for the American Cancer Society Pedal to End Cancer event. Information on 2019 Pedal to End Cancer Fundraising Incentives is coming soon!